Hardwood floors are the perfect addition to any home, creating a timeless, beautiful look. However, as tough as wood floors are, over the years they can suffer from wear and tear, especially in areas which are well lived in. The good news is, flooring specialists can apply refinishing techniques, which involve sanding away a very thin layer, re-staining and adding a clear, polyurethane finish, to ensure your wooden floors look as good as new. For those curious about what to expect when refinishing hardwood flooring, let’s look at some of the common questions we get asked, separating the facts from the fiction. 1. Can I refinish just one room? This is only possible if the hardwood flooring is restricted to one isolated area or connected to rooms with different types of flooring, such as carpet or tile. If your wood floors continue into other rooms of the home, you cannot sand, stain and refinish the one area. This would affect the uniformity and leave the rest of your wood floors looking different. The only way to refinish one room is to install a transition piece (or if there’s one in place already). Therefore, it’s best to refinish all your wood floors rather than one place such as the hallway or kitchen. If unsure, call a professional for a consultation. 2. What’s the best time to have our hardwood floors refinished? The ideal time to refinish your wood floors is when you first move into your home or when you’re moving out (once your furniture has gone). This is the most convenient time to refinish hardwood flooring because all the furniture will be off the floors. While it’s not impossible to refinish wood floors when furniture is present, it’s more difficult, time-consuming, and expensive. If you’re wanting your hardwood flooring refinished while still living in your home, consider renting a Pod to store your furniture in for the week or if you have enough room, put everything in the garage. When sanding down your floors, re-staining them, and adding new polyurethane, expect to be out of your house or off your floors for at least 4 to 5 days. The first day or two is sanding down your floors and applying the stain of your choice. The following three to four days is adding each coat of polyurethane, one coat per day. Nothing can be on your floors and no one can walk on your floors for at least 24 hours after the last coat of polyurethane is applied. However, the entire process typically takes four to five days, depending on the size of the area that needs refinishing and environmental factors which may affect drying time (such as humidity). 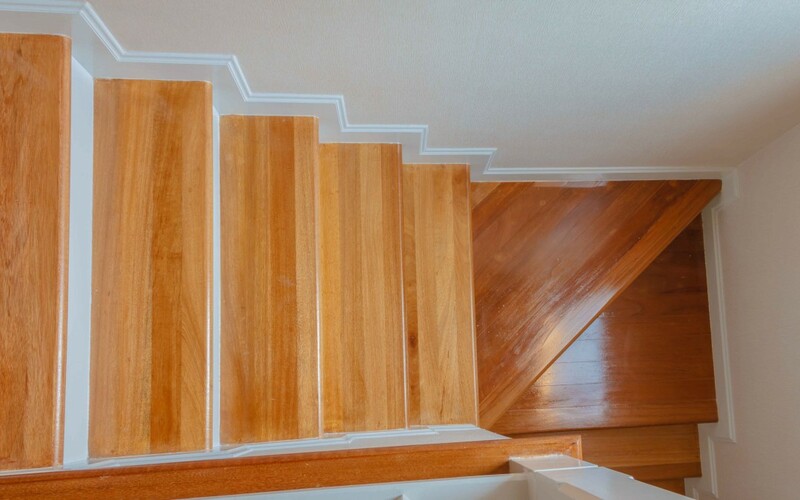 Therefore, it’s important to plan ahead when getting your hardwood floor refinished to prevent unnecessary delays. TIP: Many clients schedule to have their floors refinished while they are on vacation. 4. Rumor: engineered floors can’t be sanded or refinished. Is this true? Engineered floors can sometimes be sanded down and refinished if the actual wear layer of wood is thick enough. Engineered hardwood flooring may only have a few millimeters of wood as a top layer, so it’s important that this doesn’t get sanded down too far. The only way to tell if refinishing is an option is to have someone come by and assess your flooring. 5. Will the process create dust in my home? No system is 100% dustless, so refinishing your hardwood flooring will produce some fine dust. Although dust is captured through the equipment as much as possible, some is bound to escape. However, to combat this, the areas we’re working on will be covered by plastic to limit the dust that’s left in your property. This contains particles to the area as much as possible. Here at NewGen Restores, we understand just how much work goes into maintaining your hardwood flooring. We offer deep cleaning services which will extract dirt from deep within your floors and hardwood floor refinishing to restore them back to perfection. If you want to leave your home looking better than ever, get in touch with our experts. Great tips! love it. You saved me.